Dal was on point all weekend. Photo by Paul Balite. The Tigers field hockey team had one thing in mind when the women approached this past weekend’s tournament co-hosted by themselves and Saint Mary’s. “Slaughter!” That was their rally cry. That was the goal. And at the end of the tournament, that was the result. The Tigers rolled through the competition, going undefeated in the five-game tournament, and capping off their great showing with an 11 – 0 rout of Acadia. The tournament was the first league play the Tigers faced this season. They found their stride quickly in all facets of the game, matching their offensive prowess with a stellar defensive display as they allowed no goals, emphatically stating their intention to defend the Atlantic championship they won last season. 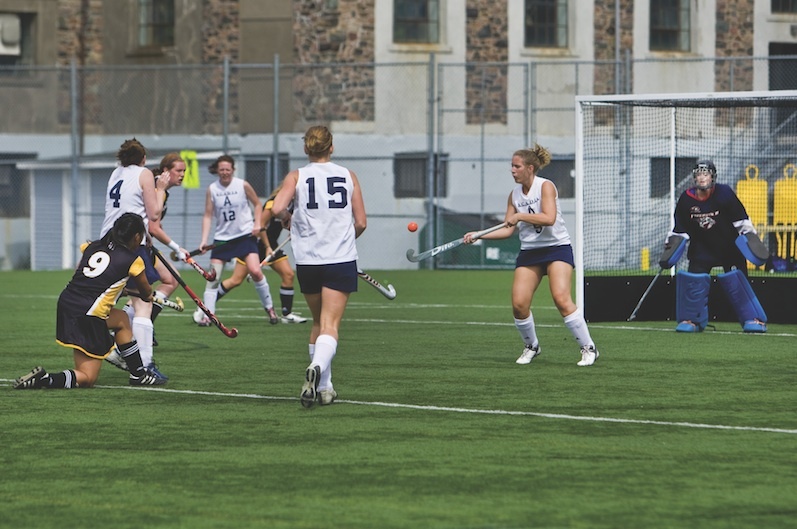 After opening Saturday with an 0 – 0 deadlock against the Huskies, the Tigers could not be restrained, beating St. FX 3 – 0 later in the day. When the tournament transitioned to Wickwire on Sunday, the Tigers remained on top, defeating UPEI 2 – 0 and UNB 3 – 0 before the offensive explosion in their final game. The 11 – 0 demolishing against Acadia featured two hat tricks courtesy of Dal’s Shelby Moore and Nikki Burge, though it seems like everyone who touched the ball wearing black and gold eventually scored. Dal captain Jessie Janes was the tournament scoring leader with four goals. Head coach Linda Bonin seemed reticent to praise her team too highly following their annihilation of Acadia, and rather told them to keep their expectations in check. 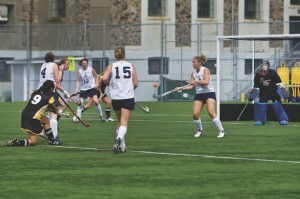 Dal’s field hockey team has a tournament in Acadia Sept. 30 – Oct. 1. The playoff tournament is at UPEI Oct. 15-16.